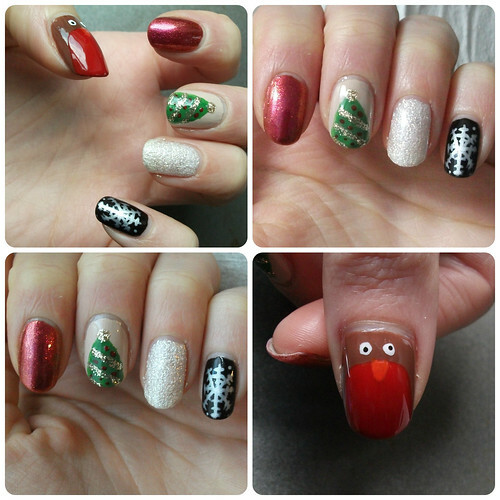 I've been getting into the Christmas spirit with a little bit of festive nail art! For the look below, I started with a coat of 17's Nail Xtras Strengthening Base Coat on each nail, before applying my base colours; I used Barry M's Matte 'Espresso' for my little finger, 17's Rock Hard Couture Nail Effects in 'Celestial Pearl' on my ring finger, Barry M Gelly Hi-Shine 'Lychee' for my middle finger, Nails Inc. 'New Burlington Place' on my pointer, and Kolor Kubes 'Coffee Bean' on my thumb, each with either one or two coats until opaque. I used Barry M's Silver Nail Art Pen to draw a snowflake onto my little finger, Models Own 'Green Grass' to add a triangle shape for a Christmas tree to my middle finger, and Rimmel Professional Finish 'Ruby Me' for an oval on my thumb to form a robin. Once these had dried, I went over the triangle and oval a couple more times to increase the depth of colour and even out patchy-ness, particularly on my thumb where the deep brown base showed through the red quite strongly at first. Next, I added detail; a dot of Khroma Beauty 'Fairy Dust' at the top of the green triangle for a star, followed by diagonal lines of 'Fairy Dust' across the tree as tinsel, and small dots of 'Ruby Me' as baubles. I also added two dots with Barry M's White Nail Art Pen above the red oval on my thumb, for eyes. I then added a small triangle of Essie's 'Orange, It's Obvious' to the red oval as a beak, and a dot of Barry M's Black Nail Art Pen to the centre of each white dot to complete the eyes. Finally, once dry, I added two coats of JacavaLONDON's Top Coat to each nail to seal in, smooth and protect my designs and add shine. I'm actually really happy with how these turned out, although I didn't attempt them on my right hand this time.. What do you think of my festive nail art? Which is your favourite design? 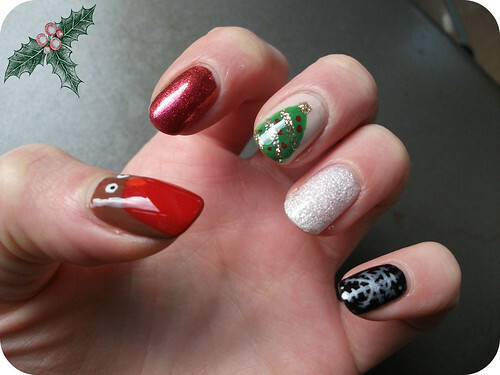 Have you done any Christmassy nails yet? Your nails look lovely :) Wish I was good at nail art! Real cute - that red is super shiny! *Looks down at own unpainted fingernails* What am I doing with my life?! ;) These are great, nail art is my nemesis. No matter what I always touch something before they're dry and ruin everything. How long did this take you? LOVE this mani!!! Wish i could do things like that, but ive not an artistic bone in my body and pics look weird on my nails - but these look fab! !